The highest level of orthopedic care in Northeastern Connecticut. 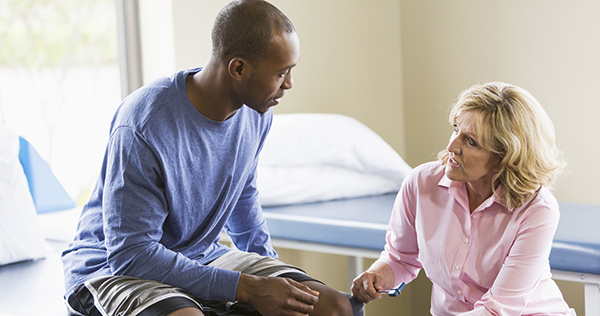 Eastern Connecticut residents don't have to leave the Quiet Corner to get first-class orthopedic care. The Orthopedics Department at Windham Hospital offers a full range of services, including Hand and Upper Extremity, Total Joint Care, Sports Medicine, Physical Therapy and Advanced Imaging. And, Windham Hospital surgeons are the first in Windham County to utilize Mako robotic arm-assisted technology for total hip and knee replacement. In 2019, Windham Hospital earned The Joint Commission’s Gold Seal of Approval® for Advanced Certification for Total Hip and Total Knee Replacement. The advanced certification is for Joint Commission-accredited hospitals, critical access hospitals and ambulatory surgery centers seeking to elevate the quality, consistency and safety of their services and patient care. And because we’re also part of Hartford HealthCare, we have access to the integrated health network’s recognized expertise, ongoing research studies that evaluate new treatments and one of the nation’s top training centers for robot-assisted surgery. The human musculoskeletal system serves as the framework for our bodies. It supports us, allows us to move and protects our vital organs. Sometimes it can be hard to figure out exactly what's causing a muscle ache or joint pain. Sore muscles, for example, could be caused by a hard workout routine — or they could be a sign of chronic pain, arthritis or other serious problem. Sometimes, even the subtlest of joint injuries is detectable before it becomes a major problem. Procedures can get to the source of the problem, relieving pain and restoring normal function to your foot. When hip pain impacts your daily life and movement, it may be time to consider replacement surgery with our Mako Robotic-Arm Assisted technology. Injury, excess weight, arthritis and other medical conditions can cause knee pain. We can help with physical therapy or surgery using our Mako Robotic-Arm Assisted technology. You might not know you have osteoporosis until you break a bone after a fall or bump. The leading causes of shoulder pain are bursitis, tendinitis and irritated rotator cuff. Treatment of injuries, and enhancement of athletic performance, for athletes of all skills and ages. A total joint replacement -- the knees, hips, ankles and shoulders -- is considered only when all pain-relief treatments are ruled out.